You may be pretty much famous on youtube or it can be an average number of popularity but both cases your subscribers will probably message you a lot. Or it can be the situation that you have haters who are bothering you again and again on the comment section of your videos. This is frustrating especially if you are up to make some engagement for legitimate/interested users on your video content. Whatever the case is, the only solution you will see here to not get bothered by such YouTube users on your own channel is by blocking them. Since you are new to such experience and just find out that blocking such users is the solution here. And now you don’t have to suffer from such situation that you are getting from other YouTubers/youtube users. Here is how you can block someone on youtube. Follow these steps to block any user on youtube. Login Youtube: Open youtube and Login to your youtube account, if you are already logged on other youtube accounts then, switch to that account on which you want to block someone. Find the User to Block: You can find the user just by simply search his username on youtube search bar. Or if you have access to his Youtube channel URL then simply go to that URL. Setting the Button: Since you are youtube channel of that person that you wanted to block, so now you need to find the option/button which will block the user. Click on About option on that person’s profile. Click on Flag icon, it will drop down the options list. Choose Block user. It will ask your confirmation, click submit. 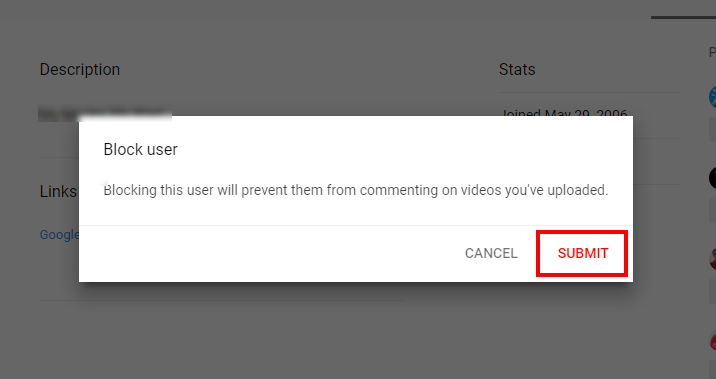 Once you are done with all the above steps then that person will not be able to comment on any of your youtube channel videos or even can’t send you a private message on YouTube.